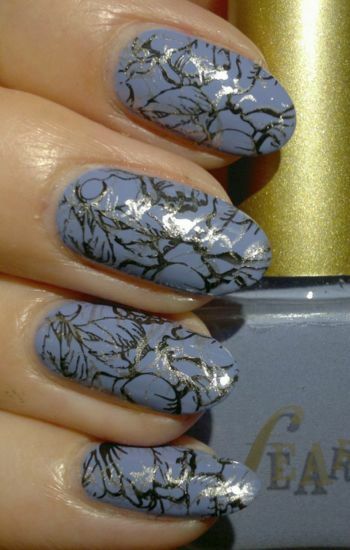 For this mani I painted my nails with Fearne Lola Lavender (2 easy coats). I love this nail polish. Great formula, dries quickly, wonderful colour. I decided to stamp, and I used one of my newest stamping plates, Pueen‘s 106 plate (which is part of Pueen‘s Make Your Day stamping collection). The two polishes I stamped with are Revlon Colorstay 270 Stiletto (black) and Sally Hansen Complete Salon Manicure 819 Coat Of Arms (gold). I really loved this mani. 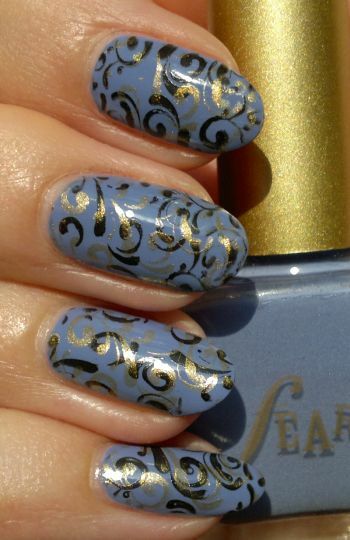 The gold and black stamping colours look really nice with the lavender base. For this mani I painted my nails with Rimmel Lasting Finish Pro 280 Pure Silver (1 coat). This polish looks gorgeous in the bottle. But it’s actually remarkably ugly because it’s very brush-strokey. So I had to fix my mani right there! 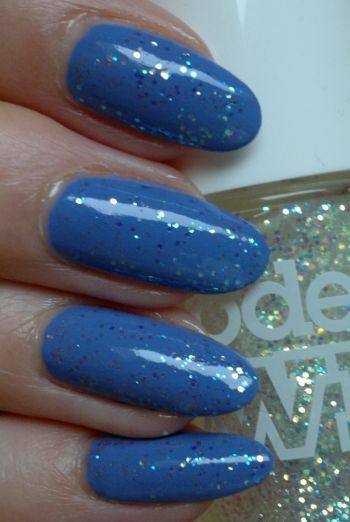 I painted 1 coat of Fearne’s Devilish Diamonds over Rimmel’s ugly polish – and it saved my mani! 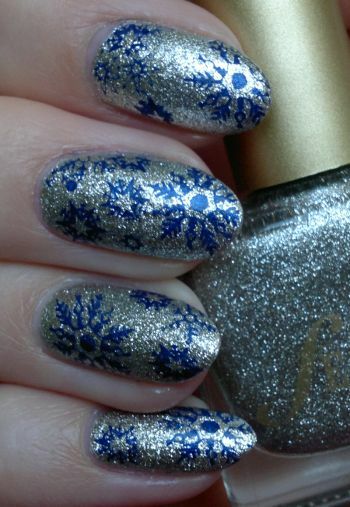 I used Filthy Gorgeous Midnight (the blue polish) and my new unbranded Christmas-themed stamping plate to add a few wintry images. Hi there! A few days ago I let my husband pick my nail colour again. He opted for a pale mint green (not my favourite colour), Fearne Minty Maggie. 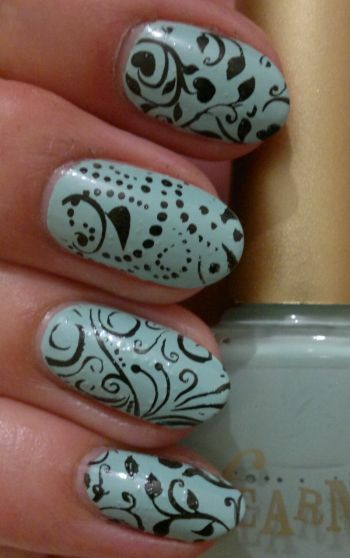 Minty Maggie is a decent polish that’s almost opaque in one coat – which is unusual for such a light shade. And the polish dried reasonably quickly too. Nice! Since I’m not the biggest fan of pastel nail colours, it didn’t take me long to decide that I would stamp. And I chose random images from Pueen’s 26 and 33 plates (both plates are part of Pueen’s Love Elements collection). The black polish I stamped with is Revlon Colorstay 270 Stiletto, my favourite black non-stamping polish that stamps perfectly. Hi there! Today I want to show you the cute mani I did the other day. I wasn’t sure if it would work out, but I really liked it. And the best thing is that it was really easy to do! 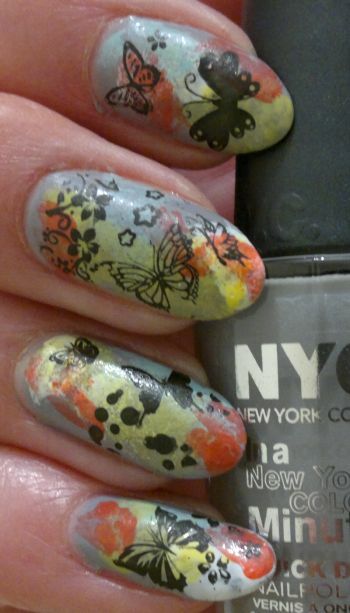 I used NYC In A Minute 019 Perfect Day (light grey, two coats) as my base colour. Fearne Minty Maggie (mint green). And then I sponged on the watercolours. It’s exactly this: I dabbed on the colours randomly – with a make-up sponge. It’s really easy. You can’t get it wrong. The last step was stamping on the butterflies. I used images from six different stamping plates. One of those plates was Pueen 39 from Pueen’s Love Elements collection. All the other plates were unbranded ones. The black polish I used to stamp on the images was Revlon Colorstay 270 Stiletto. Please feel free to tell me what you think of this mani. And thanks for stopping by.